The air ambulance company that lost three Juneau-based crew members in a presumed crash near Kake last week is now helping to look for the missing aircraft. The U.S. Coast Guard called off the search for the Guardian Flight plane Thursday after nearly three days of round-the-clock efforts to locate the Beechcraft King Air 200 turboprop and the three people inside: pilot Patrick Coyle, 63; flight nurse Stacie Morse, 30; and flight paramedic Margaret Langston, 43. Now Guardian officials say they have contracted aerial surveys of the rugged, remote coastline in the plane’s last known area over Frederick Sound, about 20 miles from Kake. The Utah-based company also plans to deploy underwater detection equipment in conjunction with federal efforts to find the plane’s wreckage. Company officials say the extra steps are being conducted in coordination with government-led efforts. “We just want to make sure we’re doing everything within our power to bring our people home,” Randy Lyman, Guardian’s vice president of operations, said Monday. 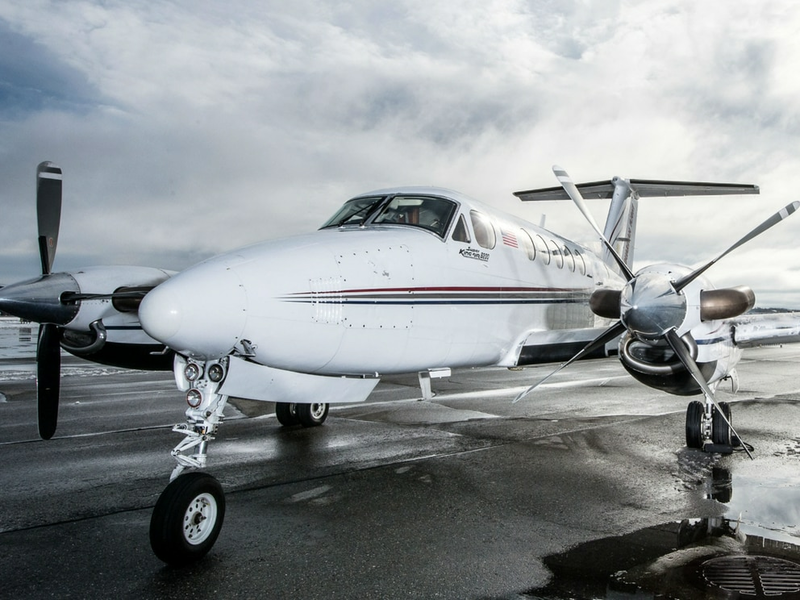 The flight took off from Anchorage last Tuesday afternoon for the roughly 600-mile trip to a patient pickup in the Tlingit village but never arrived. Searchers spotted debris in the water including part of a wing last week but not the main wreckage. Guardian has contracted with Temsco Helicopters Inc. out of Juneau to fly over the coastline and nearby land, according to Jared Sherman, Guardian Flight’s Alaska executive director. Temsco flew Friday and Saturday but high winds grounded them Sunday and Monday, and may not cooperate until Thursday, Sherman said in an interview Monday. Federal investigators with the National Transportation Safety Board plan to search the water for the ping that may be emanating from an underwater locator beacon affixed to the plane’s cockpit voice recorder. Guardian has also contracted with Alaska Claims Services to deploy a sonar device towed from a boat that could help find the wreckage, company vice-president Randy Lyman said Monday. Federal investigators met with Guardian and the company’s insurance and recovery representatives, as well as Alaska State Troopers and the Coast Guard, on Monday, according to NTSB Alaska chief Clint Johnson. “It is definitely a work in progress, but I have to stress we’re all working together to find a solution,” Johnson said. After standing down medevac flights statewide, Guardian began resuming service in Alaska on Sunday, with five of eight bases flying again as of Monday afternoon, Sherman said. Each crew member was consulted about their readiness, he said. Guardian also conducted pre-flight wellness briefings. About a third of the Anchorage-based team is back in service, Sherman said. Kotzebue remains out -- as does Juneau, where the missing crew was based.